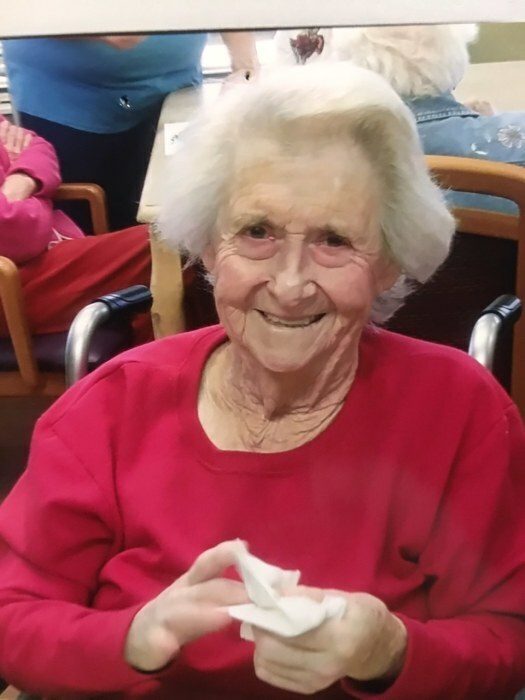 Ms. Betty Jo Johnson, 83, of Boaz, Alabama died Friday, March 29, 2019 at Diversicare of Boaz. Funeral service will be Wednesday, April 3, 2019 at 2:00 pm in the McRae Funeral Home Chapel with Rev. Jimmy Ray McCormick and Rev. Jerry Butler officiating. Burial will follow in Liberty Baptist Church Cemetery. The family will receive friends from noon until the time of service. Ms. Johnson is survived by her son & daughter-in-law Paul & Donna Johnson; daughter & son-in-law Edith & John David Nelson; daughter-in-law Rebecca Johnson; half brother Milton & Lisa Chamblee; sister-in-law JoAnn Chamblee & William Petty; brother-in-law Delon Hall; 6 grandchildren; 9 great-grandchildren. Ms. Johnson is preceded in death by her husband O.V. Johnson; former husband J.P. Cornelius; sons Barry Johnson & Steve Johnson; parents Olen & Bessie Chamblee; sister Rose Hall; brother Troy Chamblee; and half-brother Rickey Chamblee. Pallbearers Bobby Johnson, Wesley Johnson, Tim Greene, Alan Chamblee, Davie Nelson, and Terry Strawn. Family requests in lieu of flowers donations may be made to a Charity of your Choice.